Sony’nin tam kare aynasız kameraları, fotoğraf dünyasında gerçek bir devrim yaratmıştı. Sony'nin FE lens seçeneklerinin hala Canon ve Nikon fotoğraf makineleri seçeneklerinden daha sınırlı olduğu söylenebilir, ancak lens gamı geçtiğimiz 2018 yılını tümden incelediğimizde, bir yıl öncesine kıyasla çok fazla seçeneğin, kullanıcılarının tercihine sunulduğu görülecektir. Aşağıda, geniş açıyla telefotoya zoom ve prime dahil en iyi Sony FE (tam kare) lensleri sıralamaya çalıştık. . Sony’nin, Zeiss ile olan güçlü ilişkisi göz önüne alındığında, en seçici fotoğrafçıları bile mutlu edecek birçok üst düzey lensin bulunduğu görülmekte. What we like: Superb image quality. The 24-70mm f/2.8 GM is the lens that made Sony’s full-frame mirrorless cameras truly competitive with Canon and Nikon DSLRs. For Sony FE, first came the mediocre Sony 28-70mm f/3.5-5.6, then the decent Sony 24-70mm f/4, but neither was up to professional standards at this crucial focal length range. Enter the 24-70mm f/2.8 GM, which is super sharp, creates superb bokeh, and is extremely well built. All things considered, it may be the best 24-70mm f/2.8 on the market from any brand. 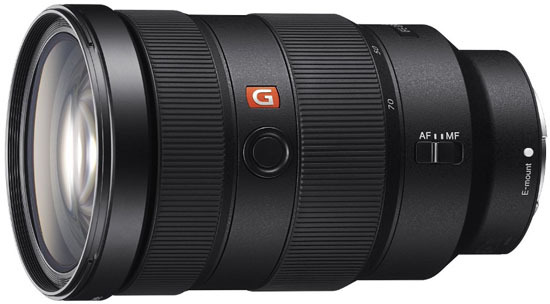 If you’re looking for the top FE zoom in terms of optical quality, the 24-70mm f/2.8 GM is it. But this lens does have its shortcomings. The first is price—$2,200 makes it considerably more costly than either the Canon 24-70mm f/2.8 ($1,599) or Nikon 24-70mm f/2.8 ($1,797). It’s also heavier than either of those two lenses at a whopping 31.3 ounces. On a compact camera like the Sony a7R III, it definitely feels like a bulky piece of glass. But the 24-70mm f/2.8 GM more than makes up for it with image quality, which is the reason it is the premier FE-mount lens. What we like: Superb optical performance overall. What we don’t: Pricier and heavier than the f/4 version below. Back when only the 16-35mm f/4 was in existence, we were quite happy with the image quality provided by that lens. But last year, Sony added the G Master version, which for serious landscape photographers and other wide-angle professionals, is difficult to pass up. Simply put, this lens is stunning. It’s extremely sharp all the way to the corners, excellent in low light for a wide-angle zoom, and creates crisp, life-like images that are hard to replicate outside of the GM family. The real question is whether you have to spend up for the 16-35mm f/2.8. The f/4 version described below is a top-notch lens in its own right, creates better sunstars, and saves you about $850 in cost and nearly 6 ounces in weight. More, most people don’t use a 16-35mm lens as frequently in low light as a more indoor-friendly zoom like a 24-70mm f/2.8, and Sony cameras have superb ISO sensitivity. The answer is that both are fine choices, but when a GM model is available, we recommend going for it. What we like: Sharper than Sony's 85mm f/1.4 at a lower price point. What we don't: Incredibly heavy. The long-awaited Sigma Art lenses with Sony FE mounts finally have arrived. At the top of the list is the 85mm f/1.4, which is extraordinarily sharp, creates beautiful bokeh, and stacks up very competitively to Sony's GM version in terms of image quality at a significant $600 discount. Based on Sigma's track record with its 85mm f1/.4 for Canon and Nikon, this should be a superb lens that makes even the most discerning portrait photographers happy. The weight of the Sigma 85mm f/1.4 is by far its biggest downside. At a whopping 39.9 ounces, it's 10 ounces heavier than the Sony 85mm f/1.4 GM, which may be a deal breaker for those looking to shave weight from their camera bag. In addition, the Sigma isn't completely weather sealed, although it does feature a surface treatment and rubber sealing at the mount connection point, instilling a bit more confidence for those venturing into tough conditions. For another intriguing Art series lens from Sigma, see the new Sigma 35mm f/1.4 below. What we like: Sharp and much lighter than the 50mm f/1.4. What we don’t: If you’re a bokeh fanatic, this lens falls a little short. For our top “normal” lens for Sony full frame, it was a close call between the 55mm f/1.8 and the 50mm f/1.4 below. Professionals and enthusiasts love the faster f/1.4 maximum aperture of the latter, but the 55mm f/1.8 offers great sharpness and is cheaper. Both lenses are far superior to the disappointing 50mm f/1.8, which hits an attractive price point but is just not up to the standards of Sony’s full-frame cameras. From an image quality standpoint, the 55mm f/1.8 is surprisingly impressive. You get a whole lot of sharpness and bokeh for an f/1.8, and autofocus is excellent. More, the 55mm f/1.8 is considerably lighter than the 50mm f/1.4 (9.9 ounces vs. 27.4 ounces). And with the high ISO capabilities of Sony cameras, there really isn't much reason to spend the additional $500 to gain less than a stop in aperture. The truth is that you can’t go wrong with either, but we prefer the smaller size and lower price of the f/1.8. What we like: Pro-grade image quality and build. What we don’t: Super heavy and expensive. There may be some G Master fatigue by the end of this article, but this premium lens series is just that good. 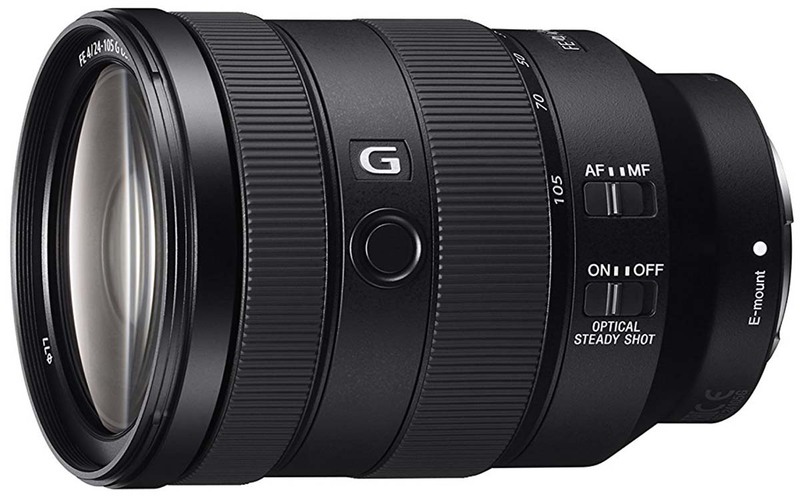 Last year we had the 70-200mm f/4 ranked higher due to availability issues with the f/2.8 GM, but that seemingly has been resolved and it’s now readily in stock online and in stores. Despite the hefty weight and price tag, the 70-200mm f/2.8 does not disappoint. The lens is super sharp, focuses quickly and accurately, and produces creamy bokeh. 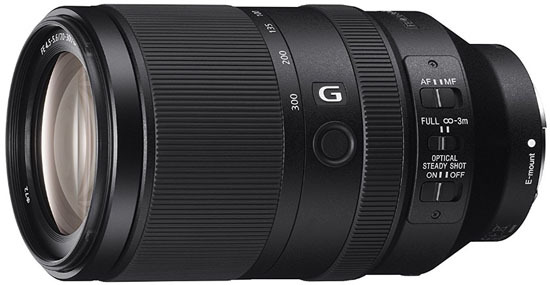 If image quality is your top priority in a telephoto lens, it’s a clear choice: go with the GM. The good news is that the Sony 70-200mm f/4 is no slouch. That lens is reasonably sharp (the images do tend to soften up a bit toward the corners), much lighter than the f/2.8 at 29.6 ounces, and more than $1,000 cheaper. Additionally, both of these lenses offer image stabilization, which proves to be incredibly useful when utilizing the higher ends of these focal lengths. 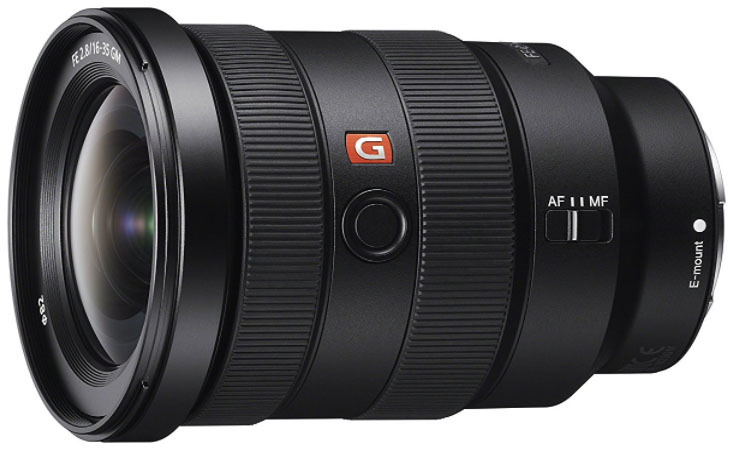 But we have a very hard time passing on a G Master lens when available, not to mention the f/4 is good but not great from an optical perspective. For even more reach, see the 100-400mm below (and yes, it’s a GM). What we like: Incredible sharpness and color rendition. What we don’t: Not heavy but a little bulky. A camera like the Sony a7R III is a super attractive option for serious landscape photographers, with a low weight and high-resolution sensor. And although the 16-35mm f/2.8 above may be the most versatile wide-angle option for FE, the Zeiss Batis 18mm f/2.8 is the premier prime. At this focal length, it's a dream pairing for the a7R III. Just how good is the Batis 18mm f/2.8? It’s extremely sharp all the way to the corners (Zeiss primes are known for their sharpness), has little distortion, incredible color rendition, and fast autofocus. In addition, the lens is reasonably light at 11.6 ounces and built to last. Other wide-angle prime options from Zeiss include the 21mm Loxia, but that lens is manual focus and not quite as wide as we prefer for landscapes. What we like: Very solid optics and great sunstars. What we don’t: Falls short of the G Master above in low light performance. We’ll start by saying that we were an early adopter of the Sony 16-35mm f/4. Based on extensive research, we felt it was the best 16-35mm f/4 on the market including those from heavy hitters like Canon and Nikon. And given that this was the first wide-angle zoom for Sony FE, a number of professionals readily adopted this lens during the wait for the inevitable GM version. Optical performance is excellent overall: the lens is sharp, has reasonable levels of distortion, and a weather-sealed build for protection from the elements. It’s a tough call between the 16-35mm f/4 and the f/2.8 GM above. In some ways, we were hoping that the GM didn’t live up to expectations (wishful thinking) and therefore it would have been easy to stick with the f/4. One important thing to keep in mind is that many landscape photographers generally shoot in good natural light and don’t need the extra one stop of aperture. In addition, you save $850 and just under 6 ounces in the process, which is notable. What we like: The do-everything lens. What we don't: You sacrifice a few stops in aperture for more zoom. Before the 24-105mm f/4, the Sony lineup felt like it was missing that reasonably priced, Swiss Army Knife of lenses. The old 24-70mm f/4 was a decent start but left most shooters feeling underwhelmed, and particularly given the ultra-high resolutions of Sony's latest camera models. And the 24-240mm is a versatile option but the large focal length range means that it's lacking in pro-level optics. 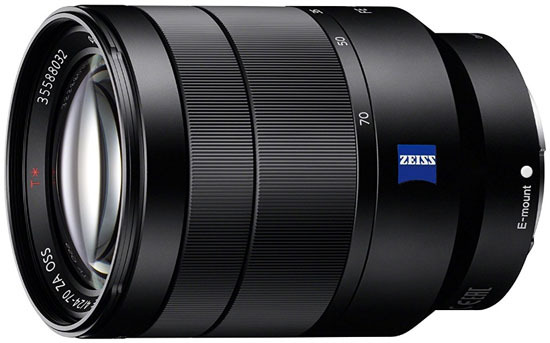 With their new 24-105mm f/4, Sony has a winner. At just under $1,400, this lens offers impressive corner-to-corner sharpness and solid versatility for everything from wide-angle photos to portraits. Many people considering this lens are on the fence between it and the 24-70mm GM above. What are the major differences, aside from the $800 in price? You'll notice more distortion and vignetting from the 24-105mm, which can be corrected fairly easily in post processing. And you will be sacrificing some low light performance with the aperture maxing out at f/4. But with the high ISO capabilities of Sony's latest a7 series cameras, this may be an acceptable trade-off for the cost savings and increased reach. If you're looking for a do-everything lens for travel or everyday use, the 24-105mm is a good value. If you shoot a lot of street and travel photography and are looking for a simple, high quality piece of glass to cover most of your needs, we'd highly recommend picking up a 35mm prime. Unfortunately, the two available options from Sony are either a bit underwhelming (the 35mm f/1.8) or overpriced (the 35mm f/1.4). Enter Sigma's Art line, which just recently launched with Sony mounts and comes to the plate in a big way with its new 35mm f/1.4. This lens is super sharp and will save you $700 compared to the Sony equivalent. Aside from the common complaint of Sigma lenses being bulky and heavy, the major concern with the 35mm f/1.4 Art is the speed of the autofocus. You'll get more hunting than with Sony's native lenses and the Sigma can have a hard time locking in, which can be quite frustrating when shooting moving subjects. Reports on this topic are mixed, however, and the cost savings is significant enough that the value and image quality may outweigh any autofocus concerns. What we like: Better low light performance than the 55mm f/1.8. What we don’t: Heavy for a prime. As mentioned above, we appreciate the lower price point and smaller size of the 55mm f/1.8, but for those who want even more low light performance and bokeh, the Sony 50mm f/1.4 is the ticket. This lens is super sharp even when wide open, produces creamy bokeh that you just can’t replicate with a slower lens, and boasts excellent build quality. It’s the real deal at 50mm. The issues with the Sony 50mm f/1.4 are that it’s super heavy for a prime and quite expensive. Both are easy to overcome if this is your most used focal length, but the 55mm f/1.8 does a pretty good job without those downsides. 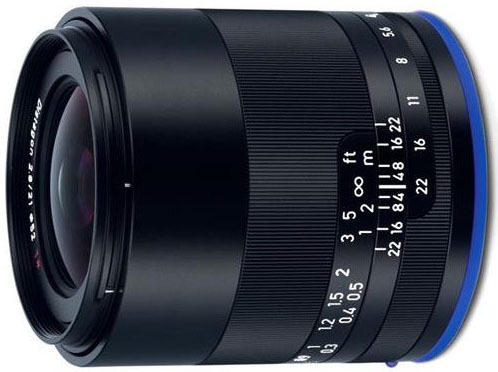 And if you have a true affinity for 50mm and deep pockets, there’s the Meyer-Optik Nocturnus 50mm f/0.95 II, which is available for Sony mirrorless for around $3,000. What we like: The ultimate in convenience. What we don’t: We think Sony a7 cameras deserve better. Amateur photographers often are attracted to the convenience of all-in-one lenses, and rightfully so. It takes most decision making and lens switching out of the equation. In other articles we recommend all-in-one lenses more highly, and particularly for APS-C cameras, but it’s more difficult for such a stellar system like Sony FE. The Sony 24-240mm f/3.5-6.3 does cover a healthy range of focal lengths from wide angle to telephoto—it’s the only lens on this list that does so. It’s also reasonably priced: for around $1,000, you can replace an entire camera bag. However, from an optical standpoint, this lens just doesn’t stack up. It’s not super sharp, has healthy levels of distortion, and the autofocus is mediocre. All in all, we understand the convenience factor and think it’s an okay solution for those on a budget, but it ultimately falls short. 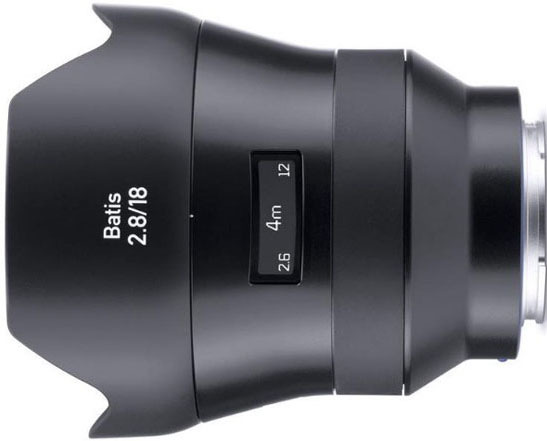 What we like: Bargain basement price (for an FE lens). What we don’t: Slightly awkward focal length. There is a lot to like about the 28mm f/2 from Sony, and most notably the price. 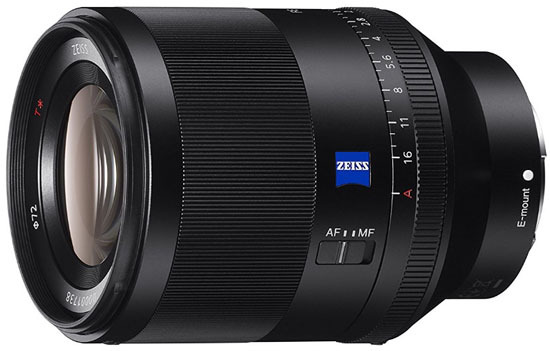 At around $450, this is the cheapest FE lens on this list by quite a bit. Sony didn’t partner with Zeiss on this one, but pretty much everything still lines up: the lens offers good sharpness, solid low light performance, and a sturdy build. The 28mm f/2 certainly isn’t targeted at professionals, but it’s great for those getting started on a budget. One notable issue we have with the Sony 28mm f/2 is the focal length. 28mm is narrower than we prefer for big landscape shots, yet a little wide for travel photography and portraiture. You can always walk closer to your subject to mimic a 35mm or 50mm lens, but 28mm certainly wouldn’t be our first choice. 42mm on Sony’s APS-C cameras is more palatable, which is how many people end up using this lens. What we like: A super telephoto lens to match the capabilities of the Sony a9 (and a7R III). What we don’t: Some people may still want to add a teleconverter for even more reach. Sony made a big splash in 2017 with the release of the speedy a9 camera body, but they needed the telephoto lenses to match. 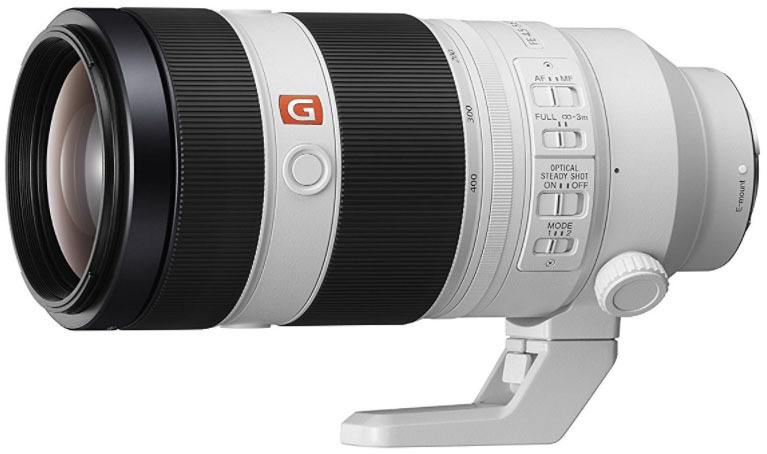 Enter the 100-400mm f/4.5-5.6, which is another premium lens in Sony’s heralded G Master lineup. For professional sports and action photographers, it represents a viable telephoto option for Sony mirrorless, and will be depended upon to perform during big events from the Super Bowl to the upcoming Olympic Games. Impressively, the 100-400mm f/4.5-5.6 is roughly the same size as the 70-200mm f/2.8 above and comes in reasonably light for a lens of this type at “just” 49 ounces. For those who need even more reach, Sony offers two teleconverters, a 1.4x and 2.0x, both of which are compatible with this lens on the a9 and a7R III. And keep an eye out for the new Sony 400mm f/2.8, which is set to be released in September of 2018. Until then, the 100-400mm GM is a really nice super telephoto option for Sony full frame. What we like: Extremely sharp all the way to the corners. What we don’t: Manual focus isn’t for everyone. If you’re going to buy a wide-angle prime for Sony mirrorless, Zeiss is the way to go. In terms of options, the biggest point of differentiation between the Loxia and Batis series is that the former is manual focus. This may be a deal breaker for some, but those who try manual focus often find that it’s relatively easy, accurate, and fun. As far as image quality goes, the Zeiss Loxia 21mm will not disappoint. It’s ridiculously sharp all the way to the corners, reasonably fast at f/2.8, and built like a true pro lens. It’s a tough call between this and the Batis 18mm above, which has autofocus and is wider but offers similar overall image quality. We think you can’t go wrong with either, and for those who specialize in wide-angle photography, a Zeiss prime is a real treat. What we like: One of the longest reaches of any FE lens. What we don’t: Low light performance and softness toward the edges. Until the 100-400mm G Master above came around, the 70-300mm f/4.5-5.6 was the only way to shoot further than 200mm. In fact, it had the longest reach of any FE lens. Unfortunately, the image quality of this lens leaves us wanting. In particular, it tends to be sharp in the middle but softer toward the edges, and will struggle in low light with a maximum aperture of f/4.5-5.6. On Sony full-frame cameras like the a7R III, it’s going to have trouble standing up to the resolution of the sensor. 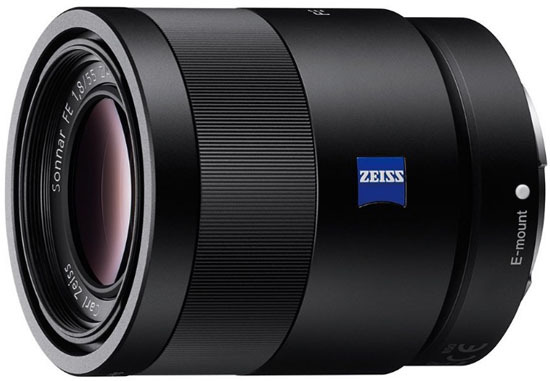 All in all, we like the Sony 70-300mm f/4.5-5.6 more for APS-C cameras (the focal length equivalent is a whopping 105-450mm), but much less so for full frame. What we like: A true ultra-wide for Sony full frame. What we don’t: Doesn’t take screw-on filters. 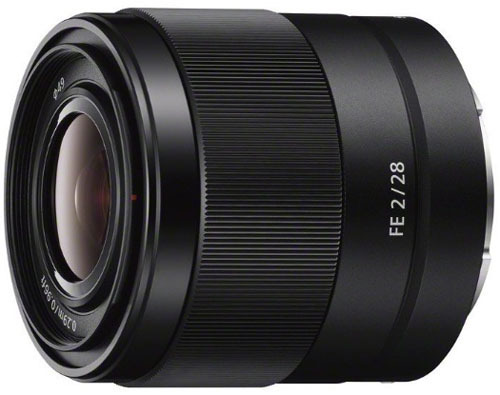 The big news of 2017 was the release of the 16-35mm f/2.8 GM above, but Sony coupled that with the new 12-24mm f/4. First, we love the effort. We personally find that a quality 16-35mm goes wide enough for most uses, but there certainly is demand for a true ultra wide and Sony answered the call. 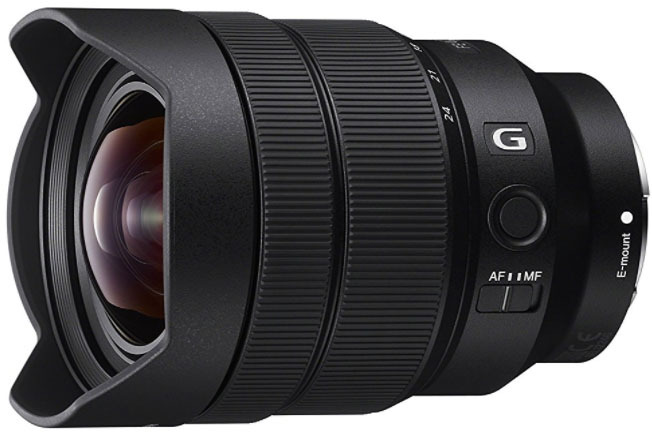 Although not a GM lens, the 12-24mm does pretty much everything well: it’s crisp, has minimal falloff at the corners, and comes in relatively light at 19.9 ounces. For wide-angle specialists who love pushing the limits, this is your lens. What are the downsides of the Sony 12-24mm f/4? The first is versatility: it’s only worth spending the $1,700 if you plan on using it frequently (and know how to, which is another challenge). Second, low light performance and bokeh fall short of the 16-35mm GM. Finally, the lens does not take screw-on filters due to its bulbous shape. These issues aside, it’s a really fun ultra wide-angle lens that compliments the 24-70mm f/2.8 very nicely in terms of focal lengths. What we like: Versatile focal length range. What we don’t: Distortion and softness. Before the release of the 24-70mm f/2.8 GM, our top pick on this list, the 24-70mm f/4 was the only FE lens option at this popular focal length. 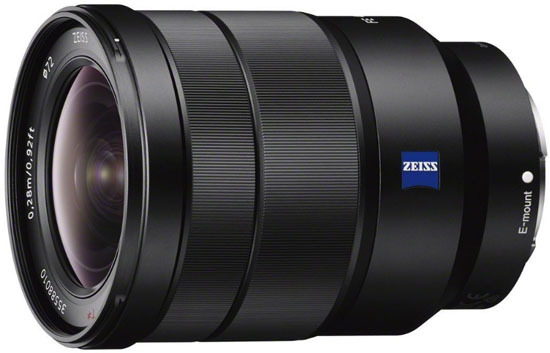 We want to like this lens, but the f/4 version just doesn’t quite do it from an image quality perspective. Distortion is heavy, softness is present and particularly in the corners, and the OSS image stabilization is unnecessary (Sony added built-in image stabilization to all its latest camera bodies). It’s not a bad lens by any means, and particularly when matched with one of the older Alpha cameras. It will even save a lot of weight for those longer days carrying the camera bag. But for a newer and higher resolution camera like the Sony a7R III, we prefer spending up for the f/2.8 version or going with the more utilitarian 24-105mm f/4 above.